Debbie is happiest by herself, or with one or two trusted friends or family members. Her ideal weekend includes a stack of books, many cups of tea, and very little talking. Her problem? Convincing other people that being alone doesn't mean being sad. Debbie explores her quiet world, and her (often unsuccessful) attempts to integrate herself into noisy environments using gentle humor and sweet cartoon illustrations. 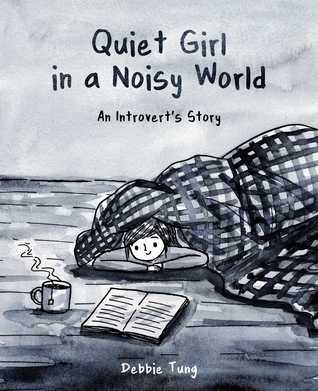 Less manic than Hyperbole and a Half, and prettier than Sarah Andersen's "Scribbles" series, this quiet girl touches on many of the same topics and issues, and shows the paths she takes when her social battery drains to 0%. Recommended for all teen and adult readers (including extroverts!) who have ever felt overwhelmed.